"The BIOSWOT project aims at paving the way to the exploitation of SWOT observations for the understanding of fine-scale biophysical processes, like notably the export of anthropogenic carbon and the pattern formation of marine biodiversity." Besides providing a great leap forward for physical oceanography (Ferrari et al. 2011), SWOT will bridge an observational gap on a spatiotemporal domain critical for our understanding of the biophysical processes (Mahadevan 2016, Lévy et al. 2012, McGillicuddy 2016, Lehahn et al. 2018). This project aims at paving the way to the scientific exploitation of SWOT observations beyond physical oceanography, focusing in particular on current biophysical questions which are in need of the filament information which we expect to derive from analyses of high resolution SSH (Sea Surface Height) maps, like notably the export of anthropogenic carbon and the pattern formation in marine biodiversity. This preparatory work will contribute to guarantee an optimal exploitation of SWOT data from the beginning of its mission by a large interdisciplinary community. What is the best theoretical framework for translating SWOT observations in 3D fine- scale information? What are the uncertainties associated? What are the regional dependencies? Ecological or biological application cannot make use of SSH directly, but require SSH-derived higher-level products instead. This part of the project will not develop new theories, but inter- compare and fine tune different theories that have been proposed in the past for extracting 3D physical information from SSH maps, using high resolution models and analytical tools. The expected outcome of this part will be a selection and optimization of submesoscale horizontal and vertical diagnostics, which we will evaluate in different oceanic regimes with model data, and which will be available to link SWOT observations to biogeochemical and ecological questions. Examples of this information to be extracted from SWOT-like observations are estimations of vertical velocities for constructing vertical biogeochemical fluxes, and - in the horizontal - submesoscale fronts and transport barriers for phytoplankton and fish patchiness studies. Examples of theories and diagnostics to be considered are different approximations schemes for the omega equation and Lagrangian methods (Figure 1). Figure 1. Example of a model work aimed at assessing how to extract vertical velocities (colorbar, m/day) from SWOT-like sea surface height together with in situ hydrographic measures. These fine- scales vertical velocities are expected to play a major role in biogeochemical and ecological processes. What is the role of filaments in the uptake of anthropogenic carbon by the ocean? 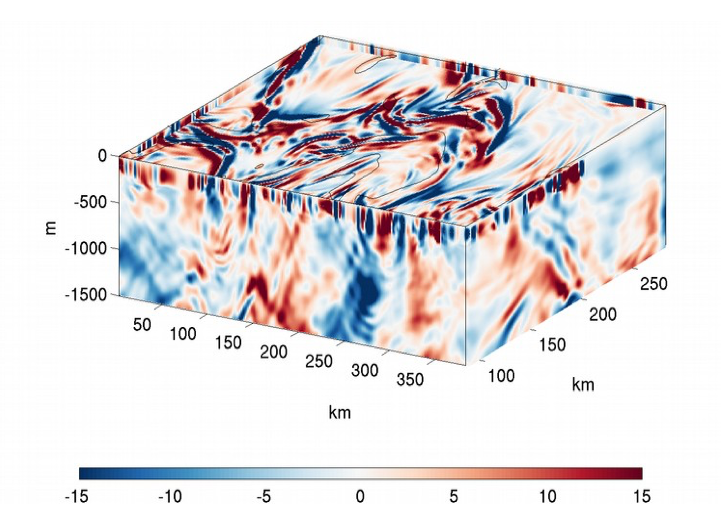 In particular, what is the combined role of oceanic submesoscale fronts and atmospheric storms on the carbon fluxes towards the interior of the ocean? How much of this information will be observable with SWOT? This process study will be developed using high resolution models in conjunction with the SWOT simulator. The role of the filaments as the key regions where ocean- atmosphere occur has been recently demonstrated. Understanding how much of this information can be retrieved by SWOT is a necessary first step to allow the use of SWOT observations in climate studies. Are there conditions in which SWOT-derived submesoscale fronts may be expected to predict hotspots of biodiversity or fish biomass? To what degree is the patchiness of phytoplankton communities and of higher trophic levels (fish) related to filament dynamics? What are the possible synergies of SWOT with other satellite mission for ecological applications? This part of the project will aim at gathering nadir altimetry based evidence of meso- and large-scale structuring of marine ecosystems by SSH, and on the identification of in situ high resolution biological datasets (e.g., acoustic campaigns) ready for SWOT observations. At the same time, awareness will be raised among the community of marine ecologists on the possibility of using high resolution remote sensing for conservation issues by organizing interdisciplinary workshops. Establishing links with the community of marine ecologists at this early stage is an important step towards promoting the use of SWOT data for conservation policies and marine resources management. What are the best sampling strategies and instrument platforms for accompanying SWOT with in situ multidisciplinary campaigns? What are the key check out experiments that need to be carried out before the launch of SWOT? Although SWOT data will be available at any time for delayed time analyses, SWOT will also serve as real time instruments for adaptive in situ studies. In terms of resolution, and hence of (sub)mesoscale experiments, the opportunity of using high resolution SSH maps in real time applications is unprecedented and may be unique for many years. Considering that the time needed to secure ship time is two to five years (coastal and open ocean campaigns respectively), discussions should be engaged now, with the aim of identifying (i) the most interesting at sea experimental question to perform during the SWOT mission (ii) which regions and strategies would be best fit to exploit near real-time SWOT data, and (iii) how to coordinate SWOT-related in situ experiments with other countries. This project will focus in particular on the fast sampling phase, which is especially interesting for submesoscale experiments, thanks to its improved temporal resolution. The activity of this part will consist in workshops aimed at designing in situ strategies, "virtual" campaigns using the SWOT simulator, and check out in situ experiments, aimed at fine tuning novel high resolution sampling strategies specifically designed to match SWOT observations. We aim in particular at setting up an international consortium of groups which will be willing of performing in situ experiments in the SWOT cross-overs during the fast sampling phase with a shared protocol. The objective is to have a multi-site in survey of the ocean overflown by SWOT which will provide snapshot of the fine-scale ocean dynamics in different regional conditions. We expect to reach a better comprehension of the link between sea surface height and three- dimensional ocean dynamics from the theoretical, numerical, and experimental viewpoint, so that we will be ready to exploit SWOT observations from its launch, with a special attention for the fast sampling phase and its high temporal coverage. The knowledge and tools developed by this project will contribute in particular to study fine-scale biophysical processes and notably nutrient upwelling, downwelling of organic matter, and the structuring effect of meso- and submesoscale features over the marine biodiversity and the trophic interactions. Ferrari, R. (2011). Ocean science. A frontal challenge for climate models. Science (New York, N.Y.), 332(6027):316-7. Lehahn, Y., d'Ovidio, F., and Koren, I. (2018). Satellite-based lagrangian view on phytoplankton dynamics. Annual Review of Marine Science, 10(1), in press. Lévy, M., Ferrari, R., Franks, P.J.S., Martin, A.P., and Rivière, P. (2012). Bringing physics to life at the submesoscale. Geophysical Research Letters, 39:L14602. Mahadevan, A. (2016). The Impact of Submesoscale Physics on Primary Productivity of Plankton. Annual Review of Marine Science, 8(1):161-184. McGillicuddy Jr., D.J. (2014). Mechanisms of Physical-Biological-Biogeochemical Interaction at the Oceanic Mesoscale. Annual Review of Marine Science, 8(1).